Valid for one VIP admission to the 2016 Cape Fear Beer Fest. Saturday March 5, 2016 at 12pm (one hour early). Please bring your voucher and valid ID to the Will Call ticket booth on the day of the event. 21+ only! 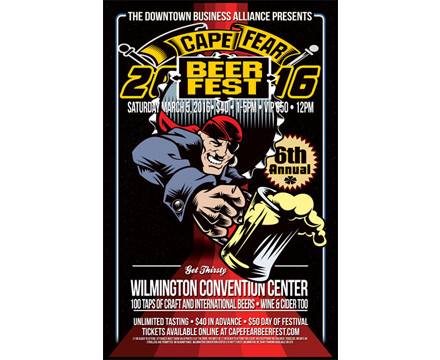 Join us for the 6th Annual Cape Fear Beer Festival in historic downtown Wilmington North Carolina. We’re gearing up for a great beer fest that will feature over 100 great American Craft Beers, Ciders and a few specialty Wines. Sample responsably and taste as many as you like on this epic day of beer. Plenty of food options on site for purchase. The CFBF will offer over 110 top quality beers made by the some of the most enthusiastic and enterprising brew masters served right here in North Carolina. Tasting, sampling and education is at the core of the CFBF experience. Responsible and educated consumption and admiration for the art of brewing is what the Cape Fear Beer Festival is all about. Join us for a one great Wilmington NC Beer Fest.